With Nationals over and the winners crowned, it is time to take a moment to recognize the top performers in the Men’s Division this season. While the talent of the division reaches far beyond short lists, these players put together what we believe to be the best seasons in the Men’s game this year. Players were selected based on both their regular season and postseason performances. San Francisco Revolver was so stacked with talent in 2015 that watching them play could make a fan’s head explode. Cassidy Rasmussen was the standout player on this roster the entire season, stepping up when the team was somewhat shorthanded during the regular season and remaining untouchable on offense all the way through to the Men’s final. He was a no-brainer selection for Player of the Year. Part of a tight, 10-man rotation on the Revolver O-line, Rasmussen tied for fifth in goals scored overall at Nationals and fourth for assists. He was everywhere the offense needed him to be, using his blazing speed and strength to work long cuts open underneath, throwing continuation goals, and then doing…well stuff like this. And that looks about right for a guy who’s described as a “Mid” on the Revolver roster. 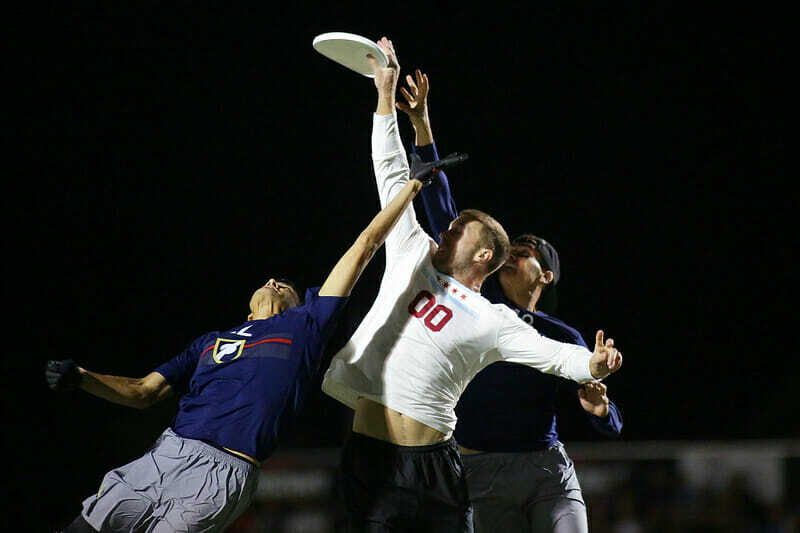 In Revolver’s double game point victory over Truck Stop in quarterfinals, Rasmussen subbed in on a defensive point and almost single-handedly worked the disc upwind for a season-saving break. He was everywhere Revolver needed him to be, and he’s not showing any signs of stopping. An underwhelming and early exit from the bracket at Nationals is unfortunate, but it’s also the best kind of motivation for a player hungry for greatness. That’s what defined Jonathan “Goose” Helton’s 2014 season and may have brought out his absolute best in 2015. At 6’0″, Helton is far from the tallest cutter on Chicago Machine, but he is the strongest and one of the fastest. Helton has already made a name for himself with his dedication to training in the offseason, and it paid off when he lined up downfield for Machine this year. He was unguardable on the ground and in the air for Chicago’s O-line, adding in some slick throwing in the red zone to make sure the point was scored when he wasn’t thrown in. He racked up 18 assists at Nationals to place him third overall. He’s also the first player to cross over to defense when Machine needs a break. Helton’s performance in his team’s semifinal against Revolver had everyone in awe. With the best defense in the country tightening its grip on Machine’s backfield, he maintained his role as a dynamic release valve and beat San Francisco defenders out, under, and on jump balls to keep Chicago in the game. As soon as handlers Bob Liu or Brett Matzuka had a clean look at Helton, they’d take the shot. He assisted or scored on five of Machine’s 11 goals. And that’s been the case all season. Helton’s physical prowess and drive make him a brutal defensive assignment, and as Chicago grows from experience in high-pressure games, look for him to be there powering the offense forward as the team’s best all-around player. It could have gone horribly wrong. Take a player midway through the season, and rely on his prodigious skills and years of experience to makeup for the lack of chemistry. Matzuka could have been the diva, the glory hog, the team killer. But he wasn’t. Instead, Matzuka saved this team’s season as only a few players in the game could. 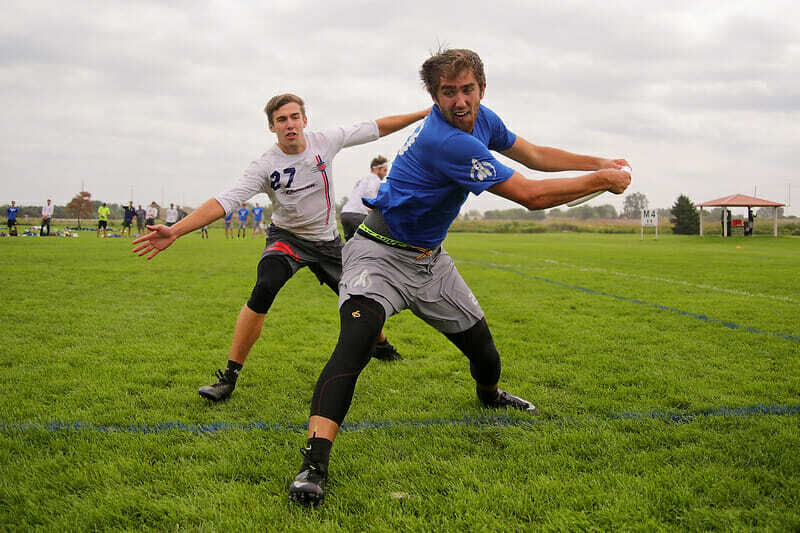 Matzuka brought his outstanding handling prowess to Chicago this year, giving the Machine O-line the ability to reset at just about any moment to just about anywhere on the field. It’s no secret that a great reset discipline can bring elite-level patience to an offense. Matzuka is the keeper of a jaw-dropping break backhand, which he appears to throw almost directly at the ground underneath his mark’s outstretched arms before it zips out and away to a teammate earning yards back to the middle of the field. 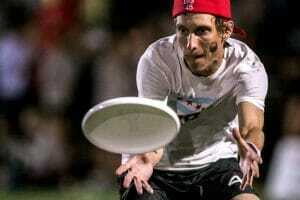 He pairs that with a mastery over the scoober and the vision and quickness to get the disc back in tight spots. 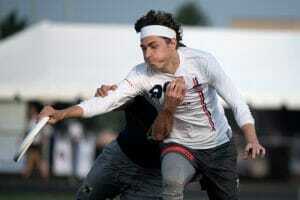 Matzuka was staggeringly consistent for Chicago in the backfield, played tenacious defense after the turn, and added much-needed depth of big game experience to Machine’s offense. He may not have lead the tournament or his team in goals or assists, but he was a vital piece of Chicago’s recovery on Friday that pushed them into the semifinals. He was the best pure handler at Nationals. Though the tides are shifting and offhand throws are becoming more prevalent, ultimate is still dominated by right-handers and defensive strategies geared around them. 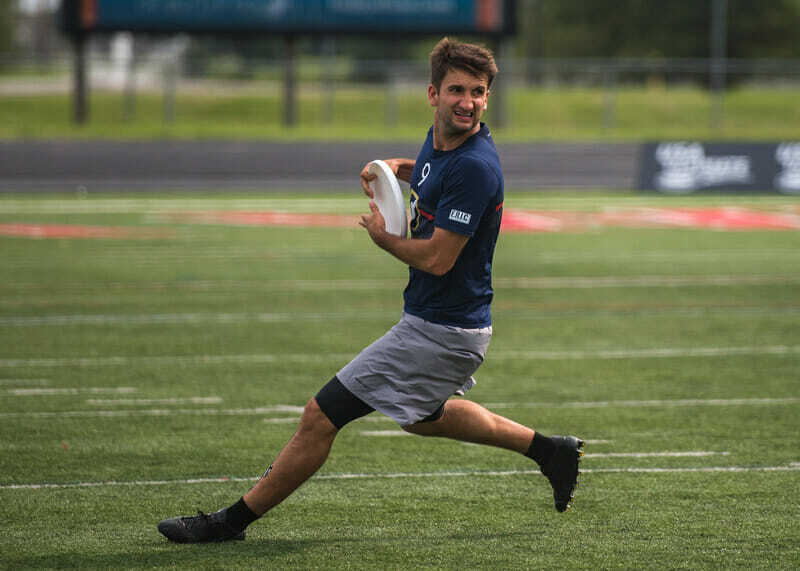 Enter Alan Kolick, who has learned to use his southpaw to such a great degree of effectiveness that he’s established himself as an elite handler in the Men’s Division. He combines his lefty shots with great use of his length and an unstoppable throw-and-go motion that kept Truck rolling all season long. Kolick isn’t much of a hucker. He’s a backfield workhorse with a dangerous first step, and that helps him both reset the disc and streak up the line for goals. 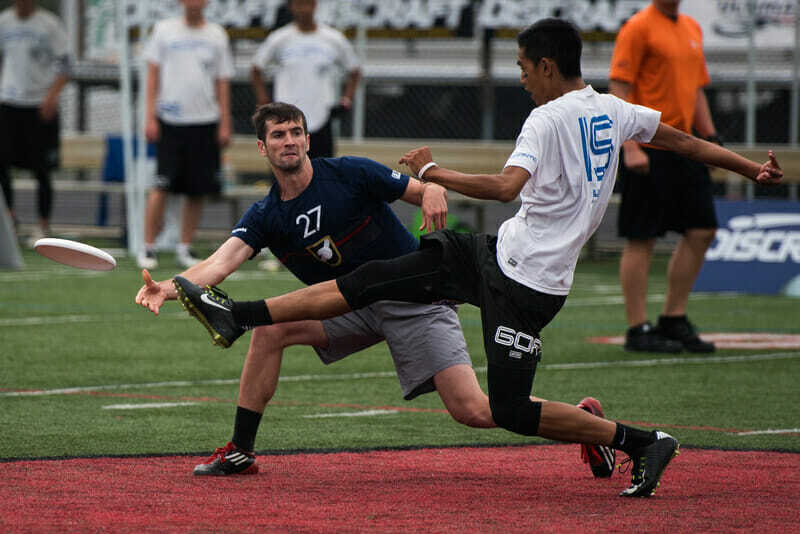 Working out of the stack can often be difficult for someone so used to operating behind the disc, but all season long and down to the wire against Revolver in quarterfinals, Kolick used his unique blend of field sense and throwing expertise to generate movement, regardless of the offense’s position. Those talents landed him tied for fifth in goals scored and tied for sixth in assists at Nationals overall, but he lead Truck in the latter and was second on the team in the former. That’s a lot to lay claim to on an offense that features Peter Prial, Jeff Wodatch, and Nicky Spiva. Truck Stop has been improving both in talent and in-season performance recently, and no doubt some of that rise can be attributed to their lefty magician in the backfield. It was double game point against Truck Stop and a steady wind was daring Revolver’s offense to work it down the field without a turn against the stout D.C. defense. That’s when Ashlin Joye put his unmatched talent for assists and years-long rapport with the game’s best receiver on display, sending a powerful huck high into the wind for Beau Kittredge to pull down for the game-winning score. Yet Kittredge was far from the only player on the end of a Joye pass bound for the end zone. He may have been a little quiet in the opening rounds of pool play, but Joye earned his spot on first team across the season and during bracket play at Nationals by tossing dimes from just about everywhere on the field and making it look easy. He led Revolver in assists at Nationals with 17, putting him fourth overall at the tournament — only five of them came during pool play. Joye, for yet another season, gave the San Francisco O-line the kind of throwing edge that made it dangerous from anywhere, making every cutter a deep threat when he could throw from movement, and able to put up the right kind of standstill shot that only his receivers could latch onto. He remains one of the most prolific throwers in the world. 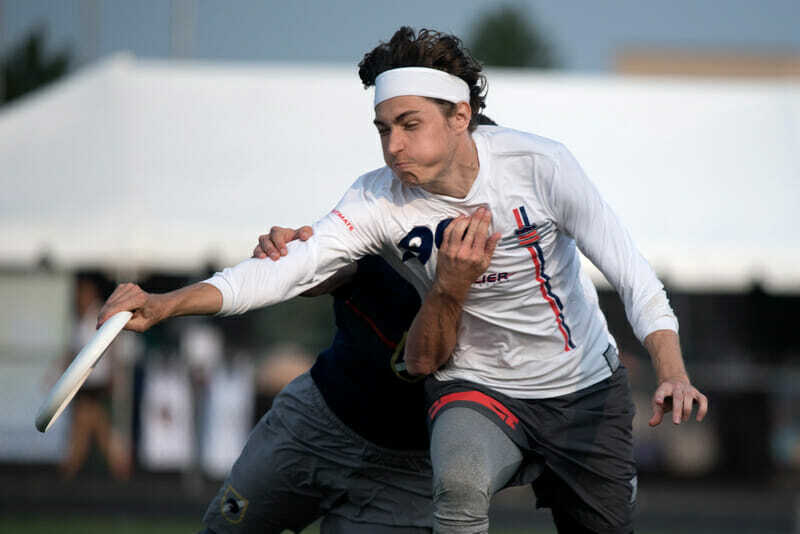 Ultimate’s first and only player to win the Callahan, the College Division, and Club Division in a single season returns for a third-straight year to the All-Club 1st team in 2015, even without a semifinal appearance. At 6’3”, Mickle is still plays the role of a stocky cutter, with the assists numbers of a star handler. 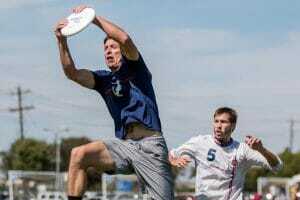 He racked up 21 goal-scoring throws in Frisco to tie for first at the tournament and continued to grow as one of the best players in the world. Mickle’s size and strength make him a two-way threat, the kind of top-notch offensive talent who lends the defensive an edge in both height and speed to force the turn, and will likely be on one end of the scoring effort. With some crucial pieces departing from the Bravo squad that won the title last year, Mickle was all the more integral to his team in every department. He’s a bonafide star and has been for years, with 2015 no different in terms of how well he used his talents to keep Bravo competitive. A controversial exit from the bracket may have left a sour taste in the mouth of Bravo players and fans and short-changed Mickle from showing off his talents late in the tournament, but it doesn’t devalue his overall performance on the season. He remains a game-breaking talent worthy of this list. Any team with Rasmussen and Joye running the show would be a dangerous one, but Beau Kittredge returns to the 1st team after his first healthy Nationals in three years and made Revolver all the more championship-worthy. His numbers don’t place him in the top 10 for goals or assists at the tournament the way they may have in previous years –he didn’t even score the most for San Francisco. But that doesn’t change the fact that Kittredge remains one of the best players to ever play the game, and with a promising group of young players around him on Revolver, he was able to be big in the way that just about no one else can be for his team in key moments. At full health, Kittredge was unmatched in his ability to use his speed, height, and length to haul everything from beautiful hucks to bail-out throws in the wind with remarkable consistency. Coach Mike Payne quickly unleashed Kittredge on defense in tight spots (he went both ways for almost all of the quarterfinal against Truck Stop), and he all but removed his assignments from affecting the game in a major way. With Kittredge bottling up big cutters used to initiating movement for opposing offenses, handler defenders like Taylor Lahey and Patrick Baylis could lock even tighter on to their assignments and force stalls and turnovers. More than anything else, being one of the best-known talents in the game makes Kittredge the one to draw heavy attention out of the stack, and while he can catch over all types of traffic, that really frees up his O-line teammates to do serious damage. Back in form, Beau may not be leaping over anyone, but he’s still one of the best the game has ever seen, and his impact was crucial in Revolver’s championship run. In the biggest moments, in the most important games, Beau consistently makes the big play. On double game point in Revolver’s toughest game of the weekend, he made one deep cut. That was all it took. 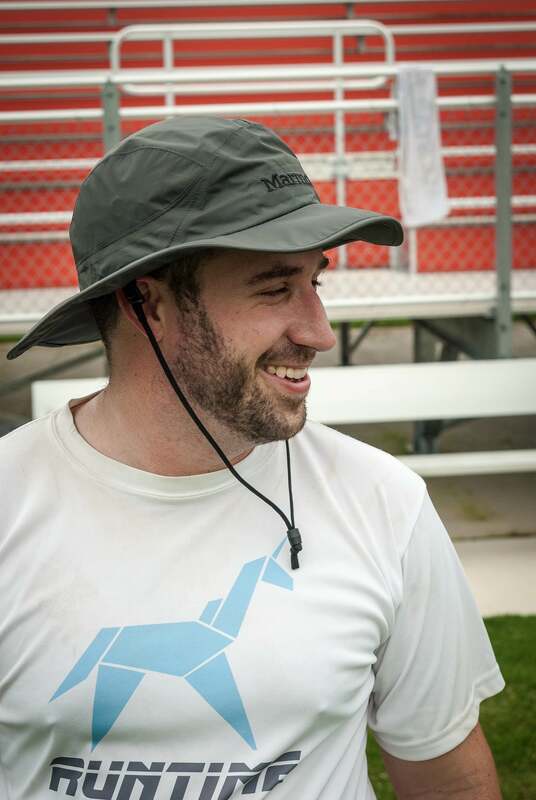 Comments on "Ultiworld’s All-Club 2015: 1st Team (Men’s)"